A widely followed measure of the Treasury yield curve has resumed its decline in recent days, dipping to its flattest level in more than a decade. The narrowing between long and short rates is generally considered a signal of weaker economic activity in the future. An inversion of the curve – short rates above long rates – would be a warning that a new US recession was brewing. 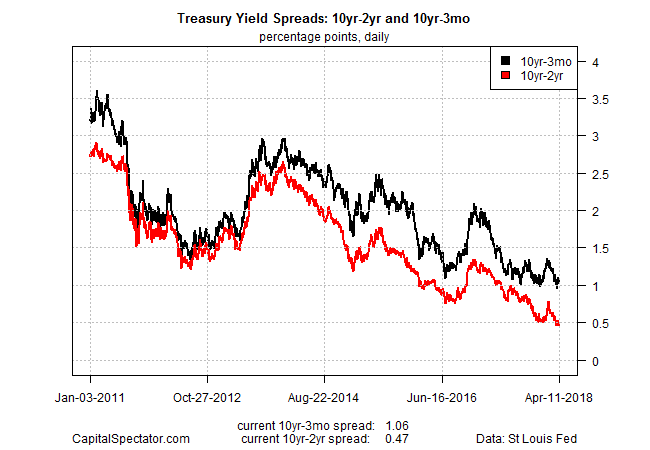 For the moment, the Treasury yield spread is still positively sloped. But the difference between the 10-year and 2-year rates edged down to 47 basis points on Wednesday (April 11), based on daily data published by Treasury.gov. That thin spread matches the difference briefly posted late last month and marks the smallest yield gap since late-2007. The odds of coordinated military action in Syria by the West appeared to be on the rise on Thursday when UK Prime Minister Theresa May summoned ministers to an emergency cabinet meeting to discuss a possible response to a suspected chemical weapons attack by Syria in recent days. A possible joint effort by US, UK, and France is on the table, which raises the possibility of a military confrontation with Russia, an ally of Syria with military forces deployed in the country. Treasury Yield Convergence: When Might Perfect Flatness Arrive?